bubble blasters are guaranteed to do the trick! - Comes with 1 cute unicorn bubble blaster. - Includes a total of 2 bottles of bubble fluid to fuel the thrill. - Comes with batteries already installed to get the fun started out of the box. - Super cute unicorn design and eye-catching colors keep little ones interested. Click 'Add to Cart' now to treat the kids to boredom-blasting bubble guns completely risk-free! COMPLETE BUBBLE BLASTERS: Get the giggly fun started right out of the box with the ArtCreativity bubble blaster gun set! 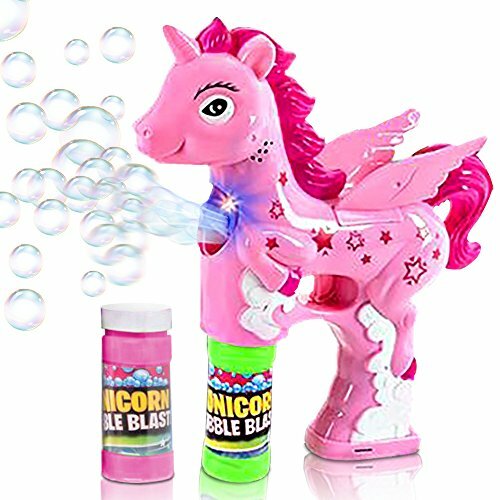 It comes with 1 (5") unicorn bubble blower gun, packed with 2 (2oz) bottles of bubble fluid and batteries already installed; so you won't have to spend extra. AWESOME LIGHT AND SOUND EFFECTS: Pressing the trigger shoots an eye-catching stream of bubbles, ignites a mesmerizing light show, and produces dynamic sound effects the kids will love. Treat that lucky kiddo to bubble blasters designed to keep them happily engaged for longer. GREAT GIFT IDEA: Whether you need a gift to give your child for the holidays, Christmas, birthday, or a reward for doing great in school, this bubble gun set makes a great present. It's also a guaranteed hit when gifted as a carnival prize and an unforgettable party favor whenever you decide to go all out. BUY RISK-FREE: We fully stand behind our products with a total satisfaction and 100% money-back guarantee. Not satisfied with the bubble Blasters? We'll send you a quick replacement or issue a full refund. Click 'Add to Cart' now to surprise your little one completely risk-free! If you have any questions about this product by ArtCreativity, contact us by completing and submitting the form below. If you are looking for a specif part number, please include it with your message.